I’ve never been one to discriminate boxed wine. It’s not below me to tap the bag. With that being said, there is a new wine trend that I can fully get behind - canned wine. 1. I’ve done the Sofia minis and LOVE them. They are perfect for keeping at home when you want a glass of wine, but not the bottle and adorable for parties. 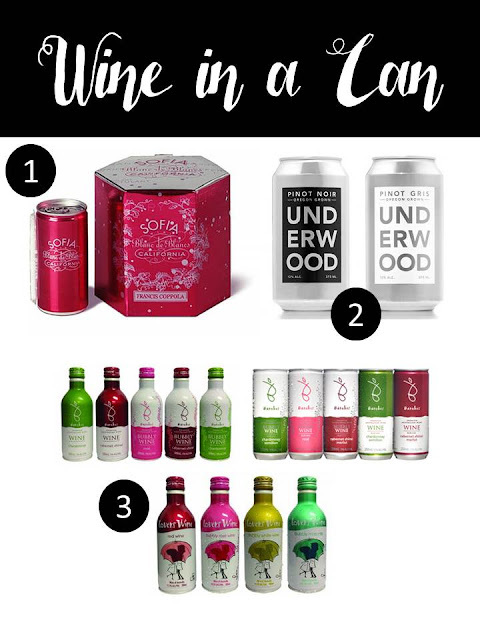 Here are some other wine in a can options.Warning - I haven’t tried these yet because PA liquor laws are dumb and we are always the last to get cool things. If you’ve tried one of these, I’d love to hear about it! 2. Underwood: Perfect for a House of Cards binge watching party! 3. Barokes Wine: From Australia, this company gets points for securing the website WineInACan.com. Barokes offers a number of wine-in-a-can options like the slim bottles in Chardonnay, Cabernet Shiraz, Bubbly Rose, Bubbly Cabernet Shiraz, Bubbly Chardonnay, the Lovers Mixes Case and a premium case.